Marla Martenson, a professional matchmaker, embarked on a spiritual journey to enlightenment, and it all started with a Buddha statue. Plus, have you ever been beaten by bamboo? (On purpose?!) Marla has! Plenty of Ouija discussion in this episode as well. From our 2nd Annual Thanksgiving Ouija Session. There are a few great people out there who have served as inspiration for my recent interest in spirit communication through the Ouija, and I’ve blogged about these folks before. If you happen to be looking for books on the topic, you probably won’t find many. I should rephrase that last statement. If you’re looking for serious books by people with experience and years of research, and not written out of fear, you’ll only find a few. Karen A. Dahlman’s latest book, The Spirits of Ouija: Four Dacades of Communication is one of them. I loved the book! Here is my review. 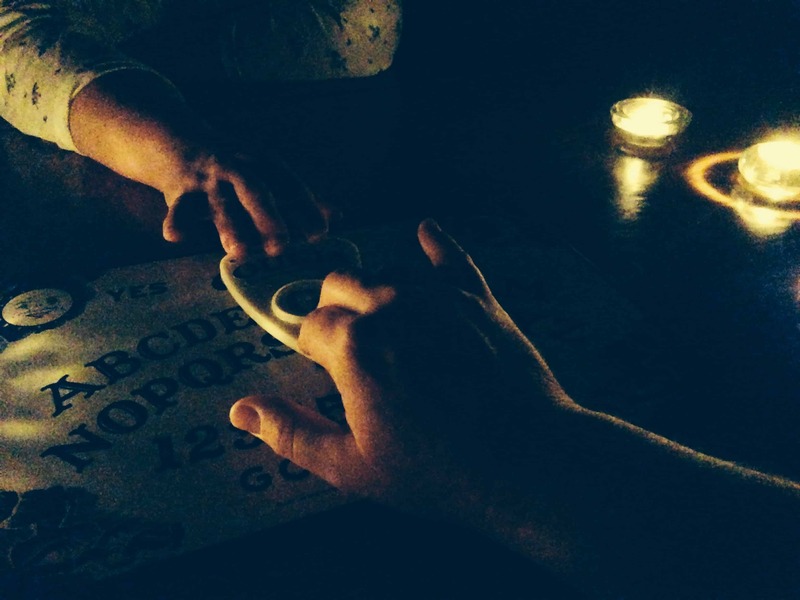 Karen A. Dahlman, who is a true Ouija-ologist, begins by giving the reader a brief history of the Ouija Board and the misconceptions that many have, thanks to Hollywood for the most part. As I mentioned in a recent post, Karen and I tend to share the same opinion when it comes to fear and the Ouija. We then get to learn about Karen’s history with the Ouija Board, how it all began, the spiritual growth she has gone through, and the wealth of experiences and learning she and many others around her have gained over four decades. There are several parts to this book that I really appreciate. First off, as someone who experiments an awful lot with spirit communication, I love that she discusses the proper use of the board, preparing the space, and just how she goes about conducting a session. She also includes an example of an opening protective prayer that I’m going to start incorporating into my sessions. Through the Ouija Board, Karen has communicated with the deceased, such as spirits and earthbound ghosts, but also communicates regularly with angels, guides, ethereal beings, and the higher self. She includes many of these examples and the messages that came across, but I never expected to read about her communication with animals, both living and dead! Have you ever thought about animal communication and the Ouija? I hadn’t! The communication that she includes from her own living pets is just fascinating! You read that correctly. She communicates with her living pets. From her author page on Amazon. Karen A. Dahlman believes that life is meant to be a joyful experience, driven by the expression of our creative inner potentials. She believes that we are able to tap this great source within when we open ourselves to all possibilities. Within her latest book, The Spirits of Ouija – Four Decades of Communication, she shares all of the insights she gained, while opening up her communication with conscious beings from the Great Beyond via the Ouija Board. Karen has a strong spiritual connection to her spirit friends as she has throughout her entire life. Highly experienced as a Ouija-ologist (one who studies the uses of the board), she teaches others about the positive benefits of using this tool as a means for expanding and deepening one’s world and expression within it in the most profound ways. Karen’s background is as diversified as her writings are controversial. She began her career as a licensed and board certified art therapist, hypnotherapist and counselor after graduating the University of New Mexico with both her bachelor and master degrees. For over a decade Karen worked within multiple settings, with varying populations, including her private practice and public workshops, while providing creative and expressive means for her clients to find health. After spending her formative years living all over the United States, she made Southern California her home in 1999. At that time, Karen hung up her therapy shingle and entered the high-tech. industry of telecommunications and founded CVC, Inc, a consulting and utility design firm for the fortune 100 wireless carriers. Coming upon its thirteenth year in operation, Karen remains at the helm as CEO. Coming full circle within her career, from right brain to left brain to center brain, she strives to maintain a balance of her total brain within her heart. Karen shares within her books, her process of doing this with herself and with others. She endeavors to help others deepen into their unique possibilities to discover their own empowerment to affect personal growth, their spiritual evolution, and a passionate expression of their calling. For more on Karen A. Dahlman, visit www.karenadahlman.com.